Programmatic buying is here, and it’s expanding fast. Industry experts say it will grow by more than 50% per year through 2016; others say that ultimately, it will capture the bulk of advertising spending. Its profit potential is unlimited. What this means is that marketing executives need to understand what programmatic buying is, and what it can do for them. Now. 1. 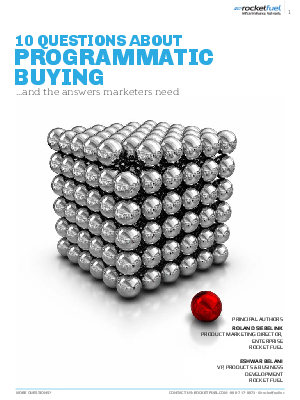 What is programmatic buying? 2. Why is it so effective? 3. When can I use it? 4. What media channels support programmatic buying? 5. How do I reach my tailored audience? 6. How do I drive success? 7. What insights can I gain? 8. What are the best practices for privacy? 9. How do I ensure my ads are served in brand-safe contexts? 10. What do I need to get started?